One-time Olympic Silver medalist Susanthika Jayasinghe’s decision recently to sell her medals created tremendous hype in society. She made allegations against the Ministry of Sports for not giving her due recognition. Jayasinghe, in a recent interview with the Daily News, said, recognition given to sportsmen and women have declined and as a result, Sri Lankans participating in international competitions have also gradually declined. She alleged that the Ministry was not providing adequate facilities and pointed out that athletes do not even have a ground with an adequate track for practice. Q: Did financial difficulties make you want to auction the medals? A: It is not a big issue, but the way they treated me made me take that decision. The problem began when I got a special award at the Platinum Awards Ceremony (organized by Sirasa TV) which was held in April. Many other sportsmen and women also got awards at the ceremony. After presenting me with the award, they requested that I make a small speech. I took that as an opportunity to express myself and let others know about the present state of sports. I spoke about the role that needs to be played by the Ministry of Sports, Athletics Association and the National Olympic Committee, in the present era. I said, mainly three things such as values, marketing and management that need to be maintained and promoted. As soon as I stepped down from the stage, the Sports Minister sarcastically reminded me that I would be coming to the Ministry to collect my cheques in a few weeks. Later, the Sports Minister stopped my cheques and said they cannot pass so easily. And he asked me to report on the work that I have done. Q: Have the ministry officials called for reports prior to this? A: This has not happened to me before; they never asked for any reports before that incident. The Minister gave me the appointment letter in July, 2016. Though they gave me the appointment letter, I wasn’t assigned to do any work. They didn’t include a job description in my letter. I had no higher official to ask what my duties were. So I was clueless. I wrote to the Ministry several times for clarification, but got no reply. I wasn’t signing or placing my fingerprint anywhere and I had no office. Q. But Sports Minister Dayasiri Jayasekara had said that he has not seen you working? A: I don’t think he would like me going to his Ministry every morning to greet him. As I said before, I was not informed about my duties. They never described what I had to do. Therefore, I did whatever I could do. As I had an understanding about sports, I looked into training of the students, checked their food, spoke to the coaches and saw to the ground facilities. I always mentioned all what I did in a letter addressed to the Secretary and submitted it before I received my cheques. All these issues began after I made that speech. I had to do a job. I did sports and nothing else. I didn’t get any academic qualification. If I don’t have a job, then my medals are the only option for my survival. Q: Did you have a discussion with the Minister regarding this issue? A: No, he never spoke to me about this. I heard all what he said through media. I have won two world championship medals, one world cup, one Olympic medal and lot of Asian medals. Though I brought fame to the country, I was not given a proper place. Q: Do you think all the athletes are not being recognized or is it just you? A: My son was home for six months without a school. They didn’t give me any prominent place. I know many other athletes whose children are going to international schools. It is very pathetic to say, but that’s the recognition that we have got so far. I cannot tell the school athletes to enter sports when we athletes who ran for the country in international competitions are not recognized. I have not been given a value and nobody recognized my talents, so how can I tell the young athletes that they can come to a professional level through sports. We represented Sri Lanka and took part on behalf of the country. We need support from the government. How can I tell the young athletes to take up sports as their future? Q: Did you write to the Ministry asking for an office before? A: Of course I did, but they never responded to any of my letters. They are all lying about things now. Q: What made you change your mind about selling your medals? A: A month ago, I sent a letter of explanation to the President about the prevailing situation at the Ministry and the way that they treated me. After that, this issue was brought up in the media; an official attached to the President contacted me and asked me to change my decision regarding selling the medals. He told me that the President is also aware of the issue and asked me to wait for some time. Now I am waiting for their reply. I got no salary for April and May, but I spoke to the Minister’s Additional Secretary and he asked me not to create an issue over it. He informed me to come and collect my cheques in two days. See what happened at the end; they need not drag it so much. Q: Were there any other activities that you did apart from what you mentioned above? A: I was not given a job description, but I can do a lot of things. I can train the students and coaches; I can also engage in empowerment programmes. I have practical experience in participating in many international competitions. I can do many things to develop and increase the standard of sports in our country. I can also do physical fitness and sprinting training. I have the potential to do many activities, but they don’t give me a chance. If the people who are working for it know the subject, they wouldn’t do this to me. If this is the situation for me, how would it be for the people who are lower than I? I have no idea what they are doing for the betterment of the sportsmen. Q: What do you think about the present state sports in Sri Lankan and about up and coming athletes? A: It has fallen now. We don’t see any improvements or great achievements. Sri Lankan athletes participating in international competitions are very low. Q: Why is it very low? A: There is no proper coaching for athletes. There is no ground with running tracks. We are unable to do training. When there are no tracks and distance marked, how can we train athletes? Q: Have you informed the Minister about this? A: I spoke openly about this. I am not sure whether others complain about it to him. I would say there are no adequate facilities for students. Many parents in Colombo from popular schools give private practice to their kids. I think the people who are doing it do not have a clear understanding about sports. Maybe they have not done sports before. Ministry can send us to foreign countries to learn the latest theories as I am qualified. They do not do anything like that. If that happens, I can train the coaches and athletes. Q: What do you expect to gain by doing all these things? A: I can stay away from all sorts of activities if they arrange at least a pension scheme for me. I need something. This is not like other sports; I think this is the same situation for all the athletes. The country and government has spent a large amount of money on her up to and beyond the point she won her silver medal. When the government came into power in 2015, she did not have a job. In 2016, I put in a cabinet paper asking that she be given a salary of Rs 60,000 until she was 60 and Rs 15,000 fuel allowance, along with a vehicle. I wanted to appoint her to this programme we were carrying out until 2024 called Talent Identification Program (TIP) as an advisor, but Cabinet gave approval for her to be employed until 2020 with a salary of Rs 60,000. Thereafter, it can be renewed. I invited her and presented her with the appointment letter and when she took it, she said, "I was paid Rs. 80,000 earlier; now you are paying me Rs 60,000." That appointment letter clearly states what her job description is because Cabinet approval for her appointment was only granted under certain conditions. We had thus identified the tasks she needed to fulfil. We were rolling out a programme to train 13-year-olds in 312 schools and what she had to do was to go meet them and help train them. Thereafter, I called her in and said, Sri Lanka has identified three levels in sports; national, Asian and Olympic and someone has to take the responsibility of training, looking into dietary needs, health and injuries of athletes in these levels. So I asked her if she could take on that responsibility. She agreed to it and then left. I did not meet her after that. She has said, I informed her to come collect her April salary as her last—I said no such thing. At a sporting event where I was the chief guest, she announced that the Ministry of Sports had done nothing for her. I then spoke to her after the ceremony and told her not to forget that it was the Ministry which was paying her salary. In April, the Secretary sent her a letter—I was not aware of this—but it did not mention anything about stopping a salary. The letter, which I have here stated that according to Clause 8 of her appointment letter, said, she needed to submit and approve her plan for the month by the Ministry Secretary, at the end of the month she had to submit her progress report and at the end of the year she needed to submit her plan for the following year. These are not big reports; she simply needs to show what she did and where she went for the month. The Secretary further noted that since her appointment, she has not submitted any of the above reports and that the Ministry has continued to pay her salary throughout even when she was sick and now officials want to see what work was done for that payment due to auditing purposes. Thus, to continue with the payments, he has asked that all reports be sent. The letter did not stop payment of her salary. On Tuesday, the Additional Secretary sent another letter to her stating that the Ministry did not intend to stop her salary, but simply asked for her progress reports and she was invited to the Ministry for a discussion about it and resolve the issues as soon as possible. You need to know that this advisory position is not attached to the minister, if she was an advisor to the minister, she will not be required to submit reports. But she is an advisor to the Ministry and thus, a public servant, and public servants have certain duties that need to be done. Earlier, she was an advisor to the minister and did not need to submit any reports, so perhaps she thought it was the same scenario here and she did not have to show any work being done to collect her salary. What I wanted was to use Susanthika’s experience and hard work to benefit the poor and hardworking young athletes of this generation. Isn’t that what she needs to do? I have no personal anger towards her, but I am disappointed to say she has no sense of gratitude. When she was sick at the Diyatalawa hospital, it was I who sent the helicopter to her so that she could be brought to Colombo and treated here. Even S.B. Dissanayake, when he was minister, has done a lot for her. After I assumed duties, she said she wanted to start an Academy, so I gave her Rs 1.1 million for that. The Sports Ministry has spent a lot of money on her and it is not my problem she has no control over her finances. I would also like to mention here that while Susanthika won an Olympic medal, there are many more athletes who have won Commonwealth games. Sriyani Kulawansa should berate us on the roads; she does not mention a word. Today, she works at the Ministry of Education for a Rs. 15,000 salary. Sugath Tilakaratne has received nothing from us. Damayanthi Darsha has not asked for a cent from us; she works in a private company now. 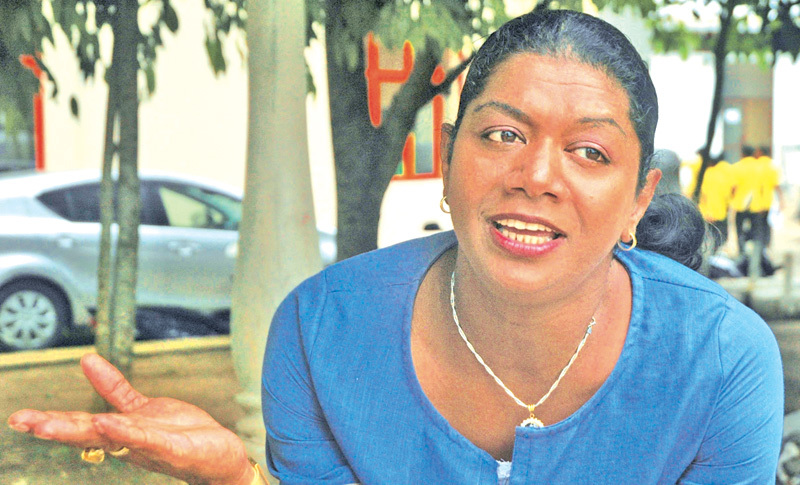 Pushpamali Ramanayake won Commonwealth medals; she did not ask for anything. There are many more boxing medalists. If the Ministry goes to look after all of them, we would go bankrupt. I asked her to do some of the trainer courses, both, level 1 and 2. It would add such value to have a former Olympian come and train new athletes, but she does not do it. She could be a good trainer. We need such skilled trainers and we have rolled out a programme now to take level 1 and 2 trainers to level 3, 4 and 5 as they have no money to pay for it themselves. All these allegations are unfair. If she is going to auction her Olympic medal, she can do it to the Ministry. The medal belongs to the country, it cannot be her private property. The country spent a lot for that. In future, I will bring in a law to prevent any athlete from selling or auctioning their medals, the medals will belong to the state. She also draws a salary of Rs. 60,000 from the army as a trainer. I don’t know what work she does there. She has scolded every Sports Minister there has ever been. Not a good word has been uttered by her. These are excerpts from Minister of Sports Dayasiri Jayasekara’s comments at the Cabinet media briefing held on June 7. Recently she was admitted to hospital after family conflict, Is that incident and sale of medal has any link ?